The Chess'n Math Association is proud to announce a 4th book for kids by Jeff Coakley entitled "Winning Chess Puzzles for Kids Volume 2". 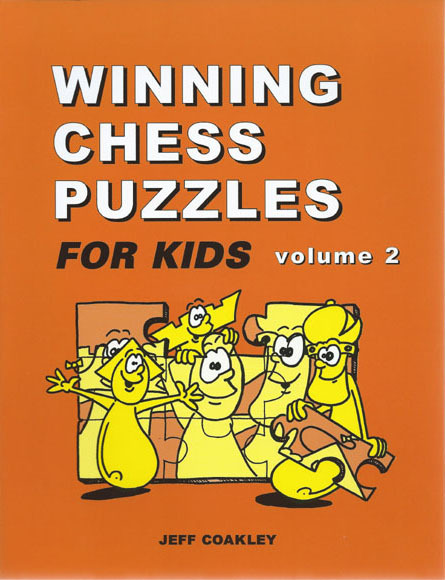 Winning Chess Puzzles for Kids Volume 2 is a fun and instructive workbook for children 7 to 13. Full of imaginitive drawings, it combines standard chess problems with a variety of insightful chess-related puzzles. Slightly more advanced than volume 1, its aim is to further develop a student's tactical skills. The main part of the book consists of exercise sheets with more than 1000 positions, covering basic mates and simple tactics such as forks, pins and discovered checks. There are also 100 pages of additional material with names like Lilly's Puzzlers, Switcheroos, Who's the Goof, Chess Mazes and Double Whammies. 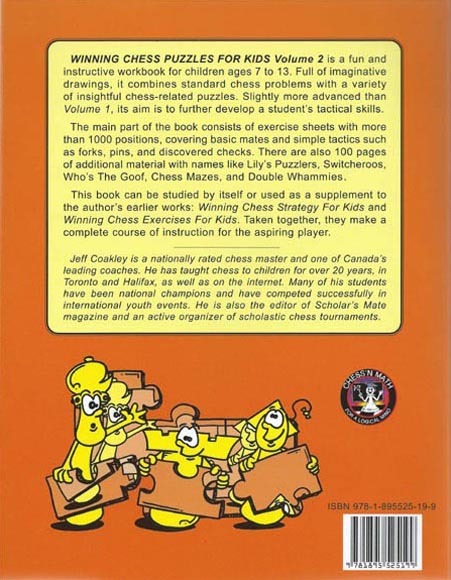 This book can be studied by itself or used as a supplement to the author's earlier works: Winning Chess Strategy For Kids and Winning Chess Exercises for Kids. Taken togeher, they make a complete course of instruction for the aspiring player.